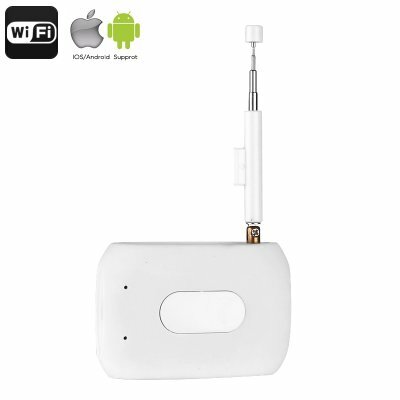 Successfully Added DTV Link - Supports DVB-T And ISDB-T, For Android And iOS, Private WiFi Network, Playback, Recording, Pause to your Shopping Cart. This DTV link is a user-friendly electronic gadget that allows you to watch live free-to-air TV channels from your iOS and Android devices. It is compatible with both DVB-T and ISDB-T digital TV transmissions, thus bringing along great usability. By creating its own private WiFi network, it will always be able to provide you with a stable internet connection. Therefore, you’ll be able to watch your favorite TV channels at any given moment without needing to search for an internet connection or using your mobile network data. Whether you’re in the office, the train, or traveling abroad, with this cool cell phone accessory you’ll always be able to watch your favorite shows. It brings along 3 hours of continuous usage time for you to enjoy throughout the day. Your DTV link accessory is compatible with both iOS and Android devices. Therefore, you’ll be able to use it with the vast majority of smartphones and tablets available. Once set up, your DTV link will automatically connect with your device. This brings along great efficiency and provides you with a simple user experience. Your cell phone gadget furthermore supports HD files. Thanks to this, you’ll be able to enjoy your favorite TV shows and series in crisp resolution. In order to increase your overall experience even further, the DTV link lets you pause, rewind, and record programs. This means that you’ll never have to miss a single detail again while enjoying your favorite media. This cell phone accessory comes with a 12 months warranty, brought to you by the leader in electronic devices as well as wholesale electronic gadgets..